1886. 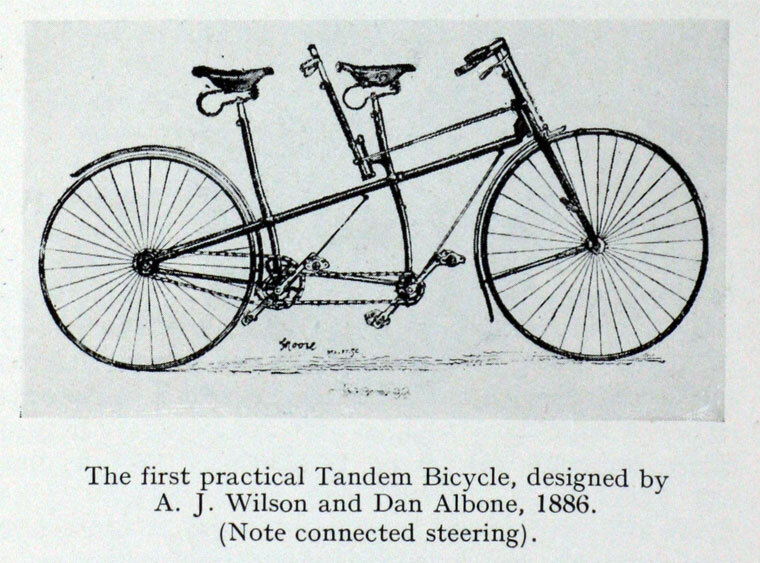 First practical Tandem designed by A. J. Wilson and Dan Albone. From 'Bartleet's Bicycle Book'. 1886. Ivel Racing Safety Bicycle. From 'Bartleet's Bicycle Book' No. 33. 1887. 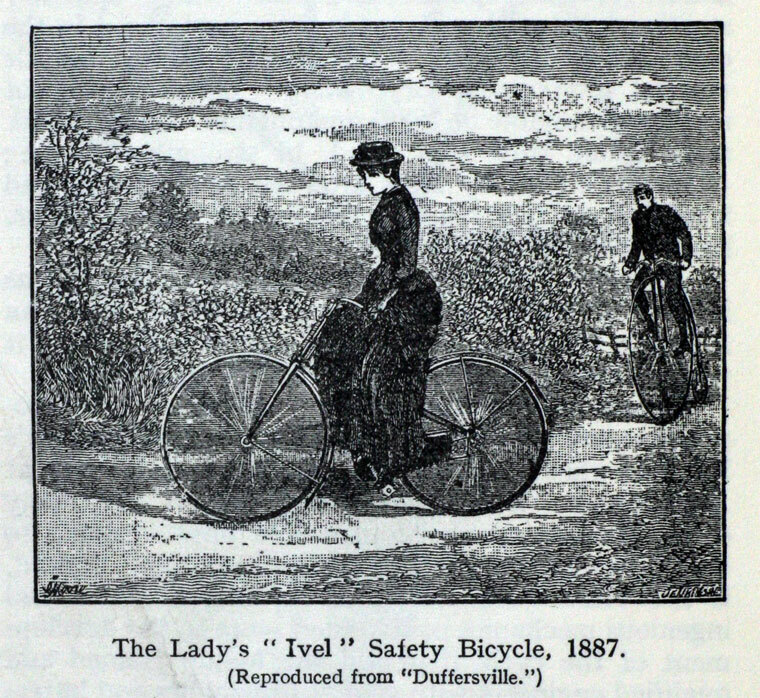 The Ivel Lady's Safety Bicycle. From 'Bartleet's Bicycle Book' No. 33. 1880 At age 20 Daniel Albone founded the Ivel Cycle Works in the yard of the Ongley Arms, making bicycles for himself and his fellow sports cyclists. His first products were the Ivel Light Roadster and the Ivel Racer. 1885 John Kemp Starley exhibited his Rover Safety bicycle at the 1885 Stanley Cycle Show. Dan copied this idea, and combined it with the Hillman, Herbert and Cooper cross-frame design to produce the Ivel Safety cycle, in April 1886. This became very popular with sports cyclists. On 5 October 1886 G. P. Mills, on an Ivel Safety, achieved a world record 24 hour distance of 294.5 miles. In 1886 Dan applied his knowledge of low friction wheels to produce a strong, light weight pony trap. This had a steel axle with ball bearings, and bicycle type steel and rubber wheels. The result was smooth and fast, and the pony trap was popular. The axles were also sold separately, to the Great Northern Railway company. Dan went on to invent a tandem safety bicycle with Arthur James Wilson, cycle pump clamps with Richard Tingey, and a child carrier accessory for his cycles. 1900 Shows his car at the 1900 Stanley Cycle Show. The motor car was based on a 3 hp single cylinder Benz engine. He was driving a prototype around Bedfordshire in 1898, and exhibited it in London in 1900. A five seat version was developed, called the Ivel Landaulette, with an 8 hp twin cylinder engine. 1901 Introduced Ivel motor bicycle. This was a strengthened bicycle, with a 1.25hp engine driving the rear wheel. No. 33. 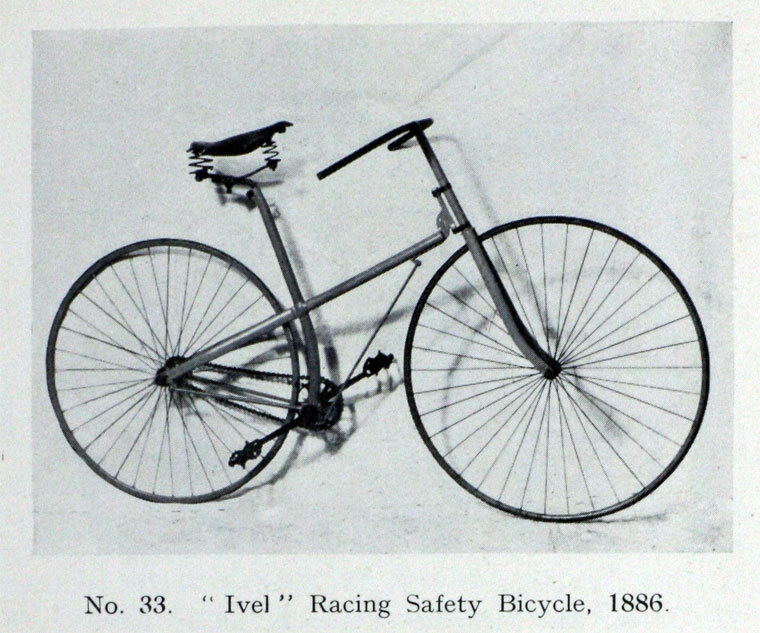 'Ivel' racing bicycle. Presented by Councillor C. W. Brown, North Finchley. Weight 27i lbs. Date 1886. Made by Dan Albone, Biggleswade, Beds. This is a representative specimen of the "cross-frame," a type which was built by many manufacturers in the early days of the “safety " bicycle. The "Ivel," though manufactured in comparatively small numbers, secured a substantial reputation among racing cyclists; this was largely due to the personal popularity of its maker, who (a Biggleswade man by birth — he was born in the village in September, 1860, lived there all his life, and died there on 30th October, 1906) won the championship of the district on five occasions, and several times held the county championship. Once Albone's enthusiasm took him as far as Holland, where he won a 5 kilos international tricycle race, and three other prizes at the same meeting. In 1888, in company with E. E. Glover, “Dan" beat the 50 miles tandem bicycle record on the road, covering the distance in 2 hrs. 53 mins. In addition to making bicycles and breaking records, keeping the "Ongley Arms" Hotel, and fathering the local cycling club, Dan Albone was always willing to turn out, day or night, and assist riders in search of record honours or going for private time trials: these, together with many other cyclists who had benefited by "Dan's" self-denying attention, presented him with a gold watch chain and an illuminated address. In 1885 and 1886 the great George Pilkington Mills, of the Anfield Bicycle Club, was associated with Dan Albone in the manufacture of "Ivel" cycles, and it was on a machine identical with this exhibit (except that Mills used 30 inch back and 32 inch front wheels) that Mills beat the 50 miles road record in 1886; the course used was from the 30th milestone from London, on the North Road, straight away to the 80th milestone. Mills enjoyed the advantage of a favouring wind, and his time was 2 hrs. 47 mins. 36 secs. This was not beaten till 1889, when M. A. Holbein did 2 hrs. 43 mins. 32 secs., the fastest time ever done on solid tyres. Features worth noting in this "Ivel" are the hollow bracket spindle and rear wheel spindle: steering head and neck made from parts used in the construction of the "ordinary" (high) bicycle (special components for "safety" bicycles were not readily obtainable in 1886) and outside "liner" under main frame tube near head, to strengthen frame; (this was added by Mills after his own machine had fractured at this point); brazed-up non-adjustable handlebar. It seems likely that this machine, embodying as it does several departures from standard, was Dan Albone's private mount; it is also probable that it was ridden by Mills in local races on grass tracks. Before leaving the “Ivel" exhibit it is appropriate to say a few words about the origin of the lady's bicycle, which was evolved in the Ivel factory at Biggleswade. Dan Albone was one of the many clever mechanics who contributed improvements to the bicycle without being a trained engineer. Indeed, it has often been stated that practical riders and ingenious mechanics contributed more to the development of the cycle than did the highly trained and qualified engineers with strings of honours and letter, after their names. Even the great James Starley was not an engineer by education: he never passed an examination in his life. It was in 1887 that “Smiling Dan" had the idea of a bicycle designed specially to accommodate a skirted rider. He replaced the straight front tube of the "Ivel" by a curved tube from the head to the bracket, and made a leather dress-guard which he laced on to a frame fashioned from a piece of flat iron secured to the chain-stay. Dan persuaded a neighbour, a Miss Burrows, to sit on the machine, while |A. J. Wilson (who had assisted in making the alterations to the bicycle) took the photograph which is reproduced herewith. When Miss Burrows told her people what had happened, they were shocked, and it was only when Wilson promised to render the photograph unrecognisable before it was reproduced that their anxiety for the lady's reputation was appeased. This page was last edited on 24 March 2018, at 03:37.